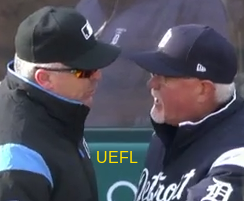 1B Umpire Bill Welke ejected Tigers Manager Ron Gardenhire (Replay Review decision that overturned HP Umpire Tony Randazzo's safe call) in the bottom of the 10th inning of the Pirates-Tigers game. With the score tied at 10, two out and one on (R2), Tigers batter JaCoby Jones hit a 3-2 splitter from Pirates pitcher Josh Smoker to left fielder Corey Dickerson, who threw to catcher Francisco Cervelli as baserunner R2 Nicholas Castellanos arrived at home plate, ruled safe by HP Umpire Randazzo. Upon Replay Review as the result of a challenge by Pirates Manager Clint Hurdle, Randazzo's call was overturned and Castellanos was out, the call was correct. Play challenged, reviewed, and overturned by the UEFL Appeals Board (0-7-2), the call was incorrect. At the time of the ejection, the contest was tied, 10-10. The Pirates ultimately won the contest, 13-10, in 13 innings. This is Bill Welke (3)'s first ejection of the 2018 MLB regular season. Crew Chief Bill Welke now has 0 points in Crew Division (0 Previous + 0 Incorrect Call = 0). This is the second ejection of the 2018 MLB regular season. This is the 2nd Manager ejection of 2018. This is Detroit's 1st ejection of 2018, 1st in the AL Central (DET 1; CLE, CWS, KC, MIN 0). This is Ron Gardenhire's first ejection since August 18, 2014 (Chris Segal; QOC = N [HBP/Foul]). This is Bill Welke's first ejection since September 13, 2017 (Clint Hurdle; QOC = N [Balls/Strikes]).